The Spark comes with its own remote control and plugs into the USB port on your TV or laptop. It comes pre-loaded with the Vudu movie and TV app, and that’s it. But it’s $10 less than the Google Chromecast and comes with a $25 credit for Vudu movies. The downside of these movie and TV-streaming sticks is you have to pay for most of the things you watch. You don’t have to pay much, but obviously it adds up depending on how much watching you do. 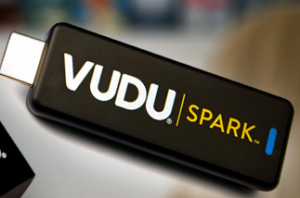 Vudu offers 10,000 titles, ranging from 99 cents to a few dollars. We forgot to mention last time we wrote about the Roku and Amazon Fire Stick that these things are sometimes quirky. Once in awhile, you may not get a signal. We get our signal back every time by simply unplugging the stick and plugging it back in again. Our guess: they get overheated and need to cool off. Integrated circuit chips tend to run hot.